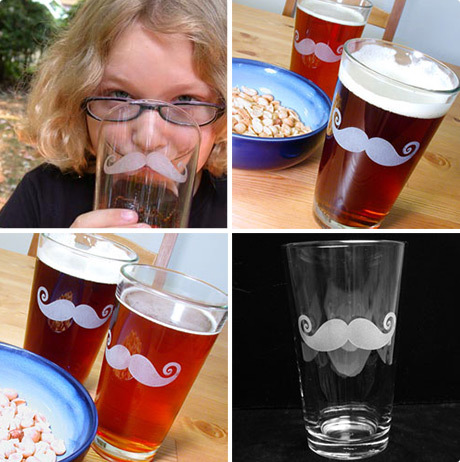 Now that I’ve shaved mine off, I could re-live my former hirsute glories by drinking out of this moustache engraved pint glass ($15). I’m really liking the idea of augmenting someones face while they’re drinking a pint. If I worked for Guinness, I’d be designing a whole range of foamy moustache and beard variations to put on their branded glasses, maybe even some speech bubbles – ‘who’s round is next? I’m almost empty’ type thing. Via: Uncrate | Cheers for the heads up Rafa. Dec 15	This entry was posted in Drinking, Handmade, Stuff to Buy by cookie. Bookmark the permalink. Looks awesome! The mustache I think needs to up a little though. Ha, neat! Must be the day for beard/mo related posts. Just saw this in my rss travels.